A-HOTEL.com - Luxury and cheap accommodation in Saint Petersburg, Russia. Prices and hotel, apartment booking in Saint Petersburg and surrounding. This indicative offer was derived from the most recently booked accommodation in Saint Petersburg and sort by the price, from cheapest Saint Petersburg accommodation to the most expensive hotels. To select accommodation by your preferences we recommend to choose from 4 453 accommodation offers in Saint Petersburg in total. By entering the dates of your overnight stay in Saint Petersburg and using the filter tools you can sort the best possible accommodation for you. The entered dates of your stay are crucial for the most accurate offer as it derives all the online information on pricing and availability of Saint Petersburg accommodation. Then you can book the selected Saint Petersburg lodging (hotels, apartments etc.) immediately. St. Petersburg is Russia's second largest city, it covers an area of 1430 km2. The population approaches 5 million meters. St. Petersburg is an important port on the River Neva, that flows into the Gulf of Finland. The city boasts many beautiful monuments placed on the UNESCO World Heritage Site. In St. Petersburg, we can offer more than 800 accommodation options, for example 3 and 4* hotels, guest houses, apartments, hostels or aparthotels. St. Petersburg also offers a number of truly luxurious hotels with exquisite services, for example Corinthia Hotel St. Petersburg or The State Hermitage Museum Official Hotel. These hotels are located in the very center of the city, nearby the Ermitage Museum, Cathedral of St. Isaac or Winter Palace. In St. Petersburg, you can also find the world's major hotels chains such as Imperial, Radisson or Grand Hotel offering all types of rooms from regular double rooms to opulent Presidential Suites. Very popular hotels are also those offering views of the river Neva. Attractive location is Petrogradskij district, Vasileostrovskij district or Admiralteyskiy district. The most popular hotels are for example Park Inn Pulkovskaya, Petro Palace Hotel, Hotel Angleterre, Sokos Hotel Palace Bridge. We also offer a diverse range of apartment accommodation. Most apartments are situated downtown. We can offer cheaper apartments to luxury ones for demanding clients. You can choose from a small studios to more bedroom apartments with terraces, that are, for example, suitable for larger groups. St. Petersburg does not have a rich history. The town was founded in 1703 by Peter the Great, who ousted the Swedes and built on the Neva River town of St. Petersburg. Until the time of the Bolshevik Revolution, the city was the seat of the tsars. Later on, architectural center along with canals and a number of palaces were built. St. Petersburg then became a cultural center with many important monuments and museums. Pushkin and Dostoyevsky for example lived here. In November 1917, there started Great October Socialist Revolution, that greatly influenced the history not only of Russia, but also around the world. January 26, after the death of Lenin, the city was renamed to Leningrad. In the 20th century, the USSR (Union of Soviet Socialist Republics) was founded. Between 1941 and 1944, was St. Petersburg for almost 900 days under the siege by German troops. Daily, hundreds of people were dying from cold and hunger. In 1991, after a fall of the Soviet Union, the city was again renamed from Leningrad to St. Petersburg. Today, the city is a popular destination for tourists from around the world. The Largest airport in St. Petersburg is Pulkovo, serving both domestic and international flights. It is located approximately 17 km from the city centre. The airport has two terminals. The first terminal is for domestic flights and some international charter flights. The second terminal is designed for international flights. St. Petersburg is also a major railway junction with several major railway stations, for example, Moskovskiy, Vitebskiy, Baltiskii or Finliandskii. From each of the stations, there are trains going to various Russian and European destinations. St. Petersburg boasts a number of monuments and other attractions. The best known and largest monument is Ermitage Museum, lying on the bank of the Neva River. It is a complex of five buildings, with hundreds of art works, you can also find inside the largest art gallery of the world. Another monument is the Peterhof Palace, listed as UNESCO World Heritage Site, with gardens with over 170 various fountains. In the Catherine Palace, you can find the Amber Room, which is considered to be a true architectural gem. Other sights include the St. Petersburg Winter Palace, the Peter and Paul Fortress, Smolensk Cathedral or the Cathedral of St. Isaac. If you are a football fan, you can not miss a visit to the local football stadium of Zenit Petersburg. From hockey clubs, the most famous is SKA St. Petersburg. Since 1995 you can also visit tennis tournament ATP World Tour 250 St. Petersburg Open that is held in St. Petersburg every year. The most famous personalities that undoubtedly belongs to the St. Petersburg is Tsar Peter II., Empress Catherine the Great, poet and novelist Alexander Pushkin, historian and poet Mikhail Lomonosov, Russian President Dmitry Medvedev, skaters Alexei Konstantinovich Yagudin and Evgeny Pluščenko or tennis player Svetlana Kuznetsova. Located in Saint Petersburg, 500 metres from Faberge Museum and 1.4 km from State Russian Museum, Anichkov Apartments offers air conditioning. Set 600 metres from Saint Isaac's Cathedral and 1.2 km from Winter Palace, Provence Apart provides accommodation situated in Saint Petersburg. Offering free WiFi and city views, St. Petersburg Classic Apartment provides accommodation situated in Saint Petersburg, just less than 1 km from Saint Isaac's Cathedral. Hermitage View 6 BR Apartment is located in Saint Petersburg, 700 metres from Petrovsky Stadium and 2.5 km from Saint Isaac's Cathedral, in an area where fishing can be enjoyed. Set less than 1 km from Church of the Savior on Spilled Blood, Apartment Konyushennaya is located in Tsentralny district district of Saint Petersburg. This property is a 10-minute walk from Palace Square and has free WiFi. Located 12 minutes' walk from the Kunstkamera Museum in Saint Peterburg city, Trezzini Palace Hotel features antique-style design and free Wi-Fi. The St.
Set in the Tsentralny district district in Saint Petersburg, Kaleidoscope on Nevskiy offers 3-star rooms with free WiFi. The property is close to several noted attractions, around less than 1 km from Anna Akhmatova Museum and around an 11-minute walk from Faberge Museum. Apartment On Rubinshteyna Street, a property with a shared lounge, is set in Saint Petersburg, 1.1 km from Anna Akhmatova Museum, 1. 700 metres from Palace Square, Apartment Nevsky Prospekt 20 is set in the Tsentralny district district of Saint Petersburg. The Hermitage Museum is within 800 metres of the apartment, and free WiFi is provided. Featuring a terrace, Natella Apartment - Penthouse Kievskaya 3 is conveniently set in Moskovskiy district district of Saint Petersburg, 4 km from St. Nicholas Naval Cathedral. 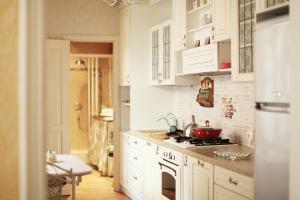 GoodRest is located in Saint Petersburg and offers self-catering accommodation. Free WiFi access is available. Situated 200 metres from State Russian Museum, Apartments near Russian Museum is in Saint Petersburg and has a casino and a garden. This property is 1. Featuring lake views, RentPiter Griboedova 99 provides accommodation with a terrace, around 700 metres from Mariinsky Theatre. The accommodation has free WiFi. Royal Hotel features air-conditioned rooms with cable flat-screen TV in the Tsentralny district district of Saint Petersburg. Built in 19th century, the property is within 2. Situated in Saint Petersburg, less than 1 km from State Russian Museum, WYNWOOD Hotel features a bar, as well as free WiFi. Located around a 14-minute walk from Palace Square, the hotel is also 1. Apartment on Nevsky prospect 23 offers accommodation in Saint Petersburg, 1.2 km from State Russian Museum and 1. Situated in Saint Petersburg, 1.3 km from Saint Isaac's Cathedral, ApartHotel Gorokhovaya 33 offers accommodation with free WiFi. Set in the Petrogradskiy district district of Saint Petersburg, just 2.1 km from Petrovsky Stadium, Natella Apartment Glukhaya Zelenina 6 II provides air conditioning and free WiFi. This hotel in St Petersburg overlooks the Palace Square and the State Hermitage Museum. It offers free Wi-Fi. Located in a historic mansion on Moyka River Embenkment, Lotte Hotel St. Petersburg combines classic interiors and modern technology.